The doors have not yet opened for 2017/8’s record-breaking panto Peter Pan but Newcastle Theatre Royal has today announced a rip-roaring show for 2018/9 – Goldilocks and The Three Bears, the pantomime that’s just right! A rollicking adventure is once again in store for seasonal favourites Clive, Danny and Dame Chris, the stars of next year’s big top family panto extravaganza. 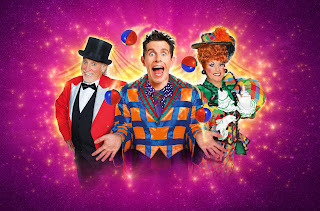 In Goldilocks and the Three Bears audiences will go straight into the fun of the fair as Danny The Clown, Ringmaster Clive Webb and Dame Rita attempt to save their Big Top from disaster. Expect magic, music, mayhem and plenty of porridge! Produced by Qdos Entertainment, the world’s biggest pantomime producer, Goldilocks and the Three Bears – the Pantomime that’s just right! promises everything that Theatre Royal audiences have come to expect, and more. Spellbinding choreography, glittering sets, breath-taking special effects and a wonderful musical score form the backdrop to a tale full of adventure, hilarious slap-stick and new for this year – a host of jaw-dropping circus acts. Will Danny win the hand of the beautiful Goldilocks? It might just take three amazing bears to join the circus and save the day. Theatre Royal pantomimes are widely thought to be among the best in the UK, due to the winning combination of father and son team Clive and Danny - for whom Goldilocks will mark their fourteenth consecutive Theatre Royal panto appearance – and their West End production quality. This combination is brought together by Newcastle’s own Michael Harrison, who co-writes, produces and directs the show. Theatre Royal Chief Executive Philip Bernays said: “It’s exciting to be able to whet our audience’s appetite for next year’s show before we even open this one. We tend to find that people race from the auditorium to the box office to snap up their seats for the following year so we need to be ready! He added: “This year’s production of Peter Pan promises to be another spectacular show and has broken a new record with a staggering 80,000 tickets sold prior to opening. We are so very proud of our pantomimes, but never wish to rest on our laurels. This is a competitive industry and we need to make sure that we are at the top of our game every single year. With Goldilocks and the Three Bears we have a show that profiles Clive and Danny’s incredible circus skills to an extent of no panto before. It’s going to be sublimely entertaining. Goldilocks, the pantomime that’s just right! plays Tuesday 27th November 2018 – Sunday 20th January 2019 and tickets are on sale for Friends of the Theatre Royal. Advantage Members, Groups and Schools can book from Thursday 23rd November and the general public from Tuesday 28th November. Peter Pan – the High Flying Pantomime Adventure plays at Newcastle Theatre Royal Tues 28 Nov ‘17 til Sun 21 Jan ‘18. Tickets for both pantos are from £13 and can be purchased from the Theatre Royal Box Office on 08448 11 21 21 (Calls cost 7ppm plus your phone company’s access charge) or book online at www.theatreroyal.co.uk (only from 28 Nov for Goldilocks).